Thoughts: Ok so this episode improves with a predictable but still fun plot twist keeping the machinations going. 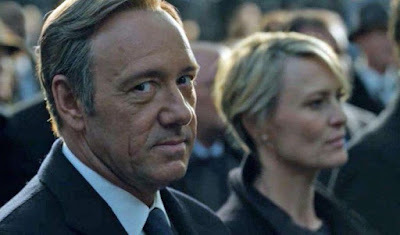 But more importantly we see an interesting psycho-emotional dynamic playing out between Claire Underwood and Tom Yates - and it's the emotional side that was so good in season 3. I'm back on board after a very weak episode 8. Running time: 45 minutes. Written by Frank Pugliese. Directed by Robin Wright. We fast forward to the Democratic National Convention in Atlanta and the open vote for the Vice Presidency. Claire Underwood gets one vote but pretends to tell everyone to back Cathy Durant. Donald Blythe briefs against Cathy Durant and heaps praise on Claire Underwood. The rumours soon reach Durant. The Jones women pressure the Texan delegate to give all their votes to Claire in exchange for $2m in campaign donations. Tom Yates has been alienating the other scriptwriters. He asks Frank straight out if they are planning for Claire to be Veep. However, they are planning to tell Cathy Durant. The Underwoods speak to both Cathy and another nominee, promising both Secretary of State if they withdraw. The gun bill has passed. Meanwhile Frank has arranged a photocall with the mother of the teenage boy whose liver Frank received with other people who received his organs. Doug Stamper visits the website of the memorial fund of the man who died because he didn't receive the liver that went to Frank. It's implied that he'll donate money. Stamper also keeps asking Seth for dirt on Leann, not believing he's clean. At Governor Conroy's house the bump from Vanity Fair has faded and the DNC is wear the story and the hype is. So Conroy and Brockhart defy convention to, well, turn up at the DNC. Stamper says to ignore but Leann and Claire say to meet with him and apologise and "kill them with kindness". Rather than actually negotiate the two candidates just play video games. When Conroy takes a call Frank calls Leann to get Aidan to track the call. She strongly advises against it. Seth tells Leann that he's digging up dirt on behalf of Stamper. As it looks like Claire Underwood is closing in on the Vice Presidential nomination, Louisiana argues that the open convention should also be open for the President and casts their votes for Durant both for President and for Vice President. It turns out that Durant called Conroy and he offered her Secretary of State. The Underwoods decide that Claire has to leave so as not to look obvious in campaigning and so she goes to Texas with Tom Yates and that he should write her acceptance speech.